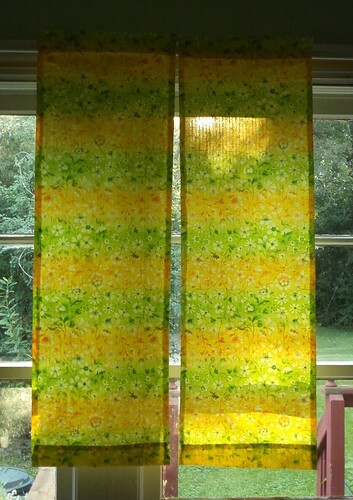 I finished the last set of curtains last night. Side door done. The stiff seersucker fabric makes the curtains hang very nice and straight. As I was sewing the hem, I had a momentary panic that I'd forgotten which way the fabric was to go and the stripes wouldn't be the same. Once I hung them from my rod, that panic disappeared. I did have to cut a foot off the panels for the hem. My inability to do math properly strikes again. Oh well. Carole says she loves them. I can't wait to see them hanging on her side door. So, what's next? 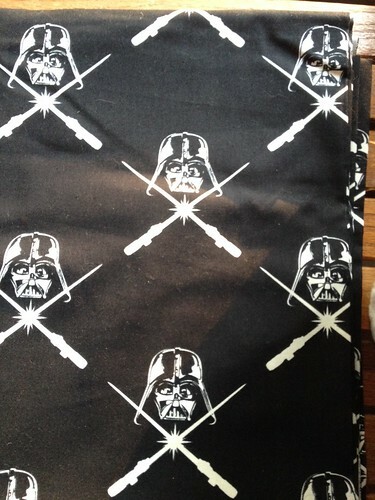 Well, while roaming the JoAnn Fabrics in search of items for another craft project, which I can't really show until after the gift is given, I stumbled upon a Star Wars fabric they didn't have at the JoAnn closest to me. Is this not awesome!? I have to finish the above named project and then I can work with this. Oh do I have plans for something. Stay tuned.